This month Kyle really got engaged with working on the back end of the blog! We added some new advertisements and I bought How I Make Money Blogging so we can try to implement some of those strategies. This month EPF was added to the Wisebread Top 1000. I applied to get on it quite a while ago and am looking forward to improving our rank. EPF was also featured as the site of the month by Narrow Bridge Finance – thanks, Eric! 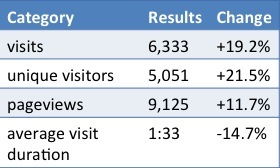 This is our analytics data from December 16, 2012 to January 15, 2013. Our traffic was a bit down because of the long winter break, but not as much as I expected so I think things are looking up for next month! “$350k income” – how did this search term find our blog?? “how to make badge for grocery and other spending” – a badge? what? “how much should i spend on groceries a month for two people 2012 canada prairies” – we live in the US. in the suburbs. so I dunno. “$80,000 a year good pay for a single guy” – yes! “all day personal finance blogs” – that’s what I want to do all day sometimes! “personal finance site by robin” – you came to the wrong blog, sorry! “is it cheaper to live separately” – definitely not. also probably worse for your marriage. “average amount of t shirts in a student’s wardrobe” – a LOT, if you judge by our closet! Did you see a traffic drop over Christmas and did your favorite blogs take time off? What advertising strategies do you use on your blog? 13 Responses to "Blog Statistics Update December 2012 – January 2013"
Haha, the search terms are awesome. That kinda thing is always interesting. I get “Disney hides things” A LOT. I think people don’t trust Disney at all, lol. Wow, that’s a weird one. Do you disparage Disney often on your blog?? Looks like you did good, especially with a break in there. My traffic was pretty good, mainly because of a Christmas gift post that got some great Google love. I applied to Wisebread a while back too, still waiting to hear from them…awesome you got listed! I generally don’t write seasonal/holiday-specific posts unless they’re really affecting my life (like budgeting for Christmas) but I can definitely see how they feel relevant for people and garner search traffic. Good work! Congrats on the wisebread listing! My site had quite good traffic over the holidays, even on Christmas day which I thought was a bit sad but at least I kept people entertained! Pauline recently posted..Friday recap, one less loan and an easy tweet! Haha it was probably from me/people like me – on Christmas morning I woke up about 4 hours in advance of the rest of my family! I exhausted all the chores there were to do as well as cooked and ate breakfast before I started doing things on the internet/my computer, which I was able to do for about an hour before the rest of the house got rolling. Nice work. I couldn’t even apply to the wisebread list because they weren’t accepting any more submissions. I would love to just apply, so congrats on getting listed. Your stats look good, especially for a slow month. Hm, maybe their applications open only in certain seasons? Congrats on the Wisebread list. I’m like Grayson and can’t even apply right now. I get lots of searches for turkey soup and turkey carcasses. I did one recipe the day after Thanksgiving, and it just keeps coming. I’ve grown a bit every month, but I think it directly correlates to how much time I have to put in and sometimes it isn’t much. I’ll take slow and steady at this point. It’s so strange how one post can generate such traffic! I’ve thought about putting up recipes before since I use a lot of them (esp. if they are good for traffic) but I want all my posts to be money-related in some way (unless blogging-related). I went self hosted just before the end of year and my traffic has definitely been growing slowly. I can understand wanting to stick to money posts only. I don’t restrict myself but I do tend towards frugal recipes so I’ve started mentioning the ‘frugal factor’ in each recipe post. It’s surely amazes me on what people type in Google and lands on your blog. You might as well monetize your blog posts for those topics while you’re at it. Sean Rasmussen recently posted..Should Your Blog Have A Facebook Page?